So much more than a case, the Smart Cover was designed alongside iPad to be its perfect match: a thin, durable cover that magnetically aligns for a perfect fit. It automatically wakes and sleeps your iPad. 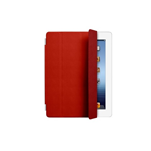 It’s a handy stand for reading, watching, and typing.Its microfiber lining keeps your iPad screen clean. And it’s a way to make your iPad as personal on the outside as it is on the inside.